This test is to check the amount of trisodium phosphate which is used as an inhibitor to test residual water hardness in incoming water and circulating heated water in boilers. 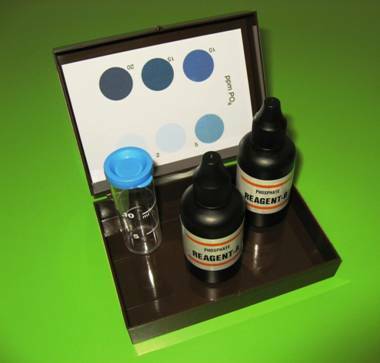 Fill the test tube with 5 ml of test water and add 4 drops of Reagent A with a dropper. Close the test tube with a lid and mix. Remove the cap, add 4 drops of Reagent B, close again with the cap and mix. Wait for 5 minutes. To determine the phosphate content in the sample, compare it to the test image. To do that place the test tubes with the holder on the image. Slide the holder so, that the water filled test tube moves along the test colors and the colored sample is on a white background. Find the closest matching color on the test, compare the colors from the top vertically looking through the tube. On the test picture the phosphate content values are in mg/l PO4.